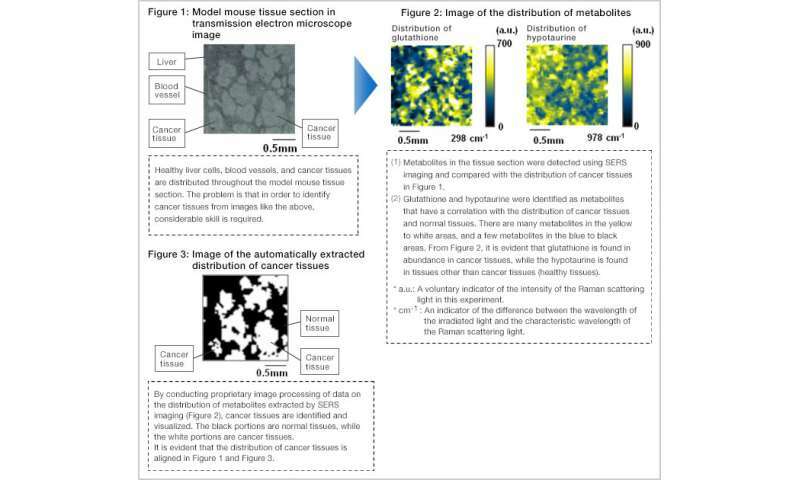 FUJIFILM Corporation has developed surface-enhanced Raman spectroscopy (SERS) imaging technology capable of analyzing large areas of unlabeled/unstained tissue metabolites with high precision using SERS that enhances the Raman scattering light when the target substance is irradiated with light, detecting substances with a high sensitivity. In joint research conducted by Fujifilm's Frontier Core-Technology Laboratories, Research and Development Management Headquarters and Keio University (Visiting Professor Makoto Suematsu, President of the Japan Agency for Medical Research and Development as a main role, Yasuaki Kabe, full-time lecturer of Department of Medical Chemistry, School of Medicine, and others), this technology succeeded in the world's first automated visualization of the distribution of cancer tissues in a section of mouse tissues from metabolite information from SERS imaging. These are innovative results that will lead to the automated pathological diagnosis of cancers, such as resistance to anti-cancer agents and determination of the degree of malignancy, in addition to enable more accurate discrimination of the progression of cancers. The results of this research will be published in the online highlight edition of the scientific journal Nature Communications on April 19, 2018. Light can be irradiated from the substrate side by using transparent glass and boehmite as the substrate. As light can be irradiated and the Raman scattering can be detected without being obstructed by the target substance, highly precise analysis is possible.